A police hunt is underway for three men armed with a machete who raided a shop in Sheffield. The masked men struck at the Co-op on Brooklands Avenue, Fulwood, at around 9.30pm last Wednesday and forced members of staff to open the tills after threatening them. 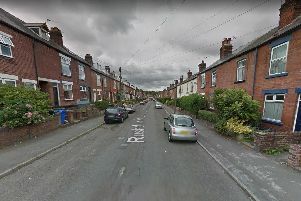 A police spokeswoman said: "At around 9.30pm on Wednesday, April 4, officers responded to reports three men, one of whom was armed with a machete, had entered the Co-op store on Brooklands Avenue, Sheffield. "The men who had balaclavas covering their faces made threats towards members of staff and forced them to open the store tills. "Alcohol, cigarettes and a quantity of cash was taken during the robbery. "Detectives are investigating the incident and are currently pursuing a number of lines of enquiry to identify the offenders involved." Anyone with information should call South Yorkshire Police on 101 or Crimestoppers, anonymously, on 0800 555111 quoting incident number 998 of April 4. At around 9.15pm on Wednesday 28 March, officers responded to reports of an armed robbery at a convenience store on Sandygate Road, Sheffield. It was reported a man armed with a knife had entered the store and made demands for cash before making off. The two members of staff were not injured in the incident, however they were left shaken by what happened. A quantity of cash of taken during the robbery. A dedicated team of officers are investigating the incident and have been working to speak to witnesses in the area and review CCTV. Anyone with information that may be able to assist officers with their investigation is asked to report it via 101 quoting incident number 1010 of 28 March. Anonymous information can also be given to Crimestoppers via 0800 555 111.